Houses designed by architects are rare. More commonly, houses built by builders as new areas of the city were annexed and platted for residential development. Most homes have evolved over time as well. Especially for 19th-century houses, the house as it currently exists may have started with a small cottage that was expanded as the owners’ needs changed. Look for the footprint of your house on the Sanborn Fire Insurance Maps (more information on this process HERE). The Sanborn company produced these detailed plans for use by fire insurance companies and fire departments during a time when fires were a common hazard. Fire insurance maps of the neighborhood, commonly called “Sanborn maps”, will show the outline of the house and any outbuildings, number of stories, and any outbuildings. Since new maps were often produced every 10 to 20 years, comparing maps may yield clues to additions and other alterations made to structures on the property, as well as changes to street names and numbers. Also keep in mind that these maps were drawn by hand — so even though they are highly accurate, some minor errors were made. Those caveats aside, the Sanborn maps are a key resource for unlocking the history of your house. A neighbor (or former neighbor) may have a cache of photos that show your house. Photos, letters, ephemera, oral history from previous neighbors/residents/owners and relatives of prior owners are best and perhaps most overlooked resources available! Several publicly available resources of historic documents and photos are categorized by the historic names of neighborhoods and one-time suburbs that are now included as now part of the city. Look for photographs taken of events (a parade passing by your house), public works projects, etc, as well as photos of past owners/residents and the house itself. Johnson Brigham’s 1911 Des Moines, the Pioneer of Municipal Progress and Reform of the Middle West Together with the History of Polk County, Iowa, the Largest, Most Populous and Most Prosperous County in the State of Iowa (1911). Des Moines has had several newspapers come and go over the years. These archives include a wealth of information. However, they are not completely indexed. If you have a construction year for your home – or extra time on your hands – they can be fascinating to read. Photographs and writeups about construction usually appear in the business section, society section, and want ads. Developers and builders sometimes advertised for plats and new construction homes when they were first built. Drake Delphic (Drake U. student newspaper), 1884-present. Card catalog exists for early citations. 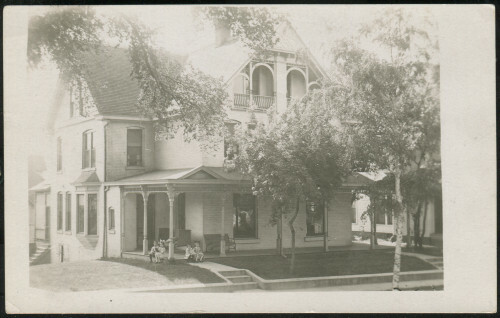 Old yearbooks, such as Drake University Quax yearbooks, often show buildings in the surrounding neighborhood as part of the photographic record. The Builder Magazine showed house plans and photographs; Better Homes and Gardens has featured many Des Moines homes over the years. More recently, The Iowan has done a lot of reporting. Postcards of Des Moines buildings can be found in antique stores and on eBay, as well as in private collections. Use search engines such as Google.com, to find documents about previous owners and the house. The Library of Congress (loc.gov) has a powerful search engine that connects library collections around the country. “Lost Des Moines” is a Facebook group where people often post old photographs. The members of this Facebook group are eager to help uncover historic resources and lost stories. Betsy Green’s Discovering the History of Your House: And Your Neighborhood is a more in-depth look at this process.